With advertisers increasing their spend on their performance marketing campaigns, it is inevitable the channel will come under greater scrutiny. One of the questions perennially raised concerns how incremental publisher activity is. While questions of ‘incrementality’ will be asked of the channel as a whole, the promotional type that comes under some of the greatest scrutiny is cashback. With incentives being offered to their membership base to encourage them to transact, are cashback sites merely converting consumers that would have bought from the advertiser anyway? How do we judge incremental? In order to understand whether or not cashback sites deliver incremental value, we first need to ascertain what constitutes incrementality. In its most basic form it could be interpreted as sales that the advertiser would not have received had it not been for the involvement of the publisher. However this is far too simplistic when we investigate incremental value. It could be easily argued that this is not the only indication of incrementality and metrics such as average order values, repeat purchases and life time value can be seen as delivering additional incremental value. With the rise of the savvy online consumer who is price conscious and prone to switching, it could be argued that cashback partners can help with customer retention which in itself could be seen as delivering incremental value. Customer journeys are complex and can vary from sector to sector. At Affiliate Window we have carried out extensive projects into click path data for various advertisers. We have been able to investigate this on two levels, firstly what happens purely within the affiliate channel and secondly, what this looks like in a complex cross channel user journey. In the first instance we have full access to this data. When a transaction occurs within the affiliate channel we are able to analyse the affiliate touch points that have been present within that path to conversion. We are able to break this down by the crossover across the various promotional types and then drill down even further to see the individual affiliates that were involved and the customer interaction across these. Contrary to common misconceptions around the channel, we typically see a single referrer in 80-90% of transactions. In addition to this, the highest number of interactions involved in any one sale through the channel is typically five or six and this will obviously vary from sector to sector and the value of the transaction. Interestingly, loyalty, reward and cashback sites typically have the fewest interactions of any affiliate type, heavily indicating they are more standalone and therefore (certainly within the channel) more incremental. Indeed it’s not uncommon for cashback sites to be the only affiliate involved in 90%+ of sales apportioned to them. Another common misnomer is that cashback sites typically overwrite content publishers who have worked hard to convert the sale, only to have a cashback site ‘steal’ their commission with the final click. Across various sectors we have again seen this isn’t necessarily the case. As mentioned, the vast majority of sales show the cashback publisher to be the sole interaction within the path to conversion and where overwriting does occur, it is typically another cashback site that is involved. This is indicative that consumers are aware of the concept of cashback and are comparing offers across the various sites before completing the purchase. While looking across the affiliate channel can be a good indication of incrementality, where we gain greater insight is in exploring the cross channel path to conversion. In order to understand this we are reliant on the sharing of data with our advertisers. This is something that we have been able to look into across various sectors. Again, there is evidence to suggest there are a number of sales generated through cashback sites where there has not been any interaction with another online marketing channel. The volume of single interaction sales also indicates that cashback sites are now the first port of call rather than merely an afterthought. This is not particularly surprising considering that the largest cashback publishers are bigger than the majority of the advertisers they promote. With a combination of promotional methods available to cashback publishers the incrementality of these customers is likely to vary. For example, with vast databases of members, if a customer is targeted with a relevant newsletter, that newsletter could be the trigger behind the transaction. In this instance it is likely that the publisher could be the sole touch point so in effect, driving a completely incremental transaction. It would be interesting to see if customers that visited the website had come via more touch points than a customer clicking through an email, or visiting through a mobile app. This would help to identify the traffic sources that provided the most incremental value for their advertisers and enable them to put a strategy in place to work across the various channels available to them. Cashback also provides a lever for advertisers to pull in order to increase the basket values of their customers. If cashback sites are encouraging consumers to spend more with each transaction is this not incrementality in its own right? Savvy advertisers have worked closely with cashback partners in order to up sell and cross sell particular products. This was evidenced by a finance client who knew that customers who purchase multiple products from them are less likely to churn and are therefore more loyal, long term customers. By offering top ups or bonus cashback premiums based on taking out more than one policy they found the quality of customers acquired through the cashback channel increased. With an engaged user base that is typically loyal to the concept of cashback rather than the brands themselves, cashback sites can act strategically to drive repeat purchase. One of our advertisers recently ran a promotion to good effect where customers were encouraged to transact more than once within a month. For the second purchase, a higher rate of cashback was paid (as long as a minimum order threshold was met in both instances). The advertiser was able to generate an increased order frequency and managed to retain customers who may have otherwise purchased elsewhere. A further myth associated with cashback sites is that they deliver low value customers. While from a retail perspective we have already identified their ability to drive higher average order values, where customer retention is a key focus we have also seen cashback sites demonstrate their ability to deliver valuable customers. Affiliate Window, in conjunction with a key telecoms client has showcased affiliate data for the programme at a number of events. 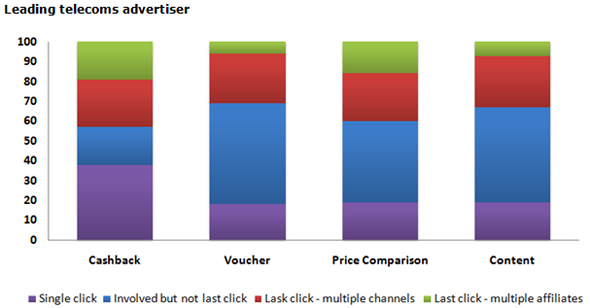 The purpose of the analysis was to understand all affiliate types including cashback. In doing so they found cashback sites demonstrated the ability to drive valuable customers, offering the greatest contribution (customers who added the most products to their package) while also having incredibly low churn rates (that stayed with them for longer). Again, by working closely with the leading cashback sites, the advertiser has been able to ensure they are driving valuable customers that they are able to retain. To summarise, cashback sites offer many sophisticated mechanisms that can help to drive customer value. It is no longer sufficient to think of them as offering a single, linear route to market. Despite the evidence presented here, cashback sites continue to come under increasing scrutiny. It can be comfortably argued that cashback partners are able to drive significantly more incremental value than other channels that do not come under nearly as much interrogation. By working closely with cashback partners, advertisers are able to set themselves highly targeted goals that frequently exceed expectations. With the increasing commoditisation and segmentation of their data, so we should expect cashback sites to continue to deliver highly targeted traffic and desirable consumers that often defy pre-conceptions.